St. John the Baptist Parish was organized on December 30, 1913, with the appointment of Father John Peters as pastor. The first Mass celebrated in the parish took place on February 1, 1914 at 4626 Gravois. Shortly thereafter land was bought on Delor and Adkins Streets and ground was broken for a building later called Sodality Hall. St. John the Baptist Elementary School opened in September with the Sisters of the Most Precious Blood of O’Fallon teaching in the classrooms in the hall. The cornerstone for a combination of school and church was laid in August 1914 and was completed in November 1914. The sisters lived in the rear of the building while Father Peters lived in Sodality Hall. In 1916, the parish purchased six lots on Adkins Street and Father Peters personally bought a house as a rectory. A second floor was added to Sodality Hall in 1917, as more classrooms were needed. An addition was made to the sisters’ residence. The parish purchased Father Peters’ house in 1924 and it was used as the rectory until 1957. A new building was constructed south of the church in 1922 and this was the beginning of St. John the Baptist High School. By 1930, the school was a four year accredited parish High School. The present church was started in 1924 and completed in 1930 with the erection of the bell tower. The old church was then converted in to classrooms and more rooms for the sisters. Within a period of 16 years, the parish had built five buildings, including adding to many of them, established and supported an elementary school and high school and acquired land for further expansion. During the next 16 years the high school program expanded and eight more classrooms were added in 1934. In 1938, the gym, cafeteria and four more classrooms were added. In 1946, another wing was added to the house, the library, and additional classrooms as well. In 1957 , a new Rectory was built and an addition was added to the convent in 1959. The elementary school was becoming outdated and a new building was started in 1963 and completed in 1964. In 2005, Resurrection of Our Lord Parish and Holy Family Parish merged to become what today is the Parish family of St. John the Baptist. The original shrine from Holy Family Parish was installed in the back of church in 2005. In 2007, the inside of our church underwent major renovation and restoration. View some of the photos before, during and after the renovation thanks to Mark Abeln of Rome of the West. In 2008, St. John the Baptist High School closed its doors officially. The Perpetual Help shrine was installed in the Summer of 2008 as well. In Fall 2009, St. John the Baptist Elementary and Pre-School moved in to what was once the old St. John the Baptist High School building. In January 2011, in honor of the episcopal appointment of our previous pastor, we have dedicated our Adoration Chapel in Bishop Rice‘s name. A sign with this designation has been placed above the entrance to the Adoration Chapel. In May 2014, our parish grade school closed its doors. 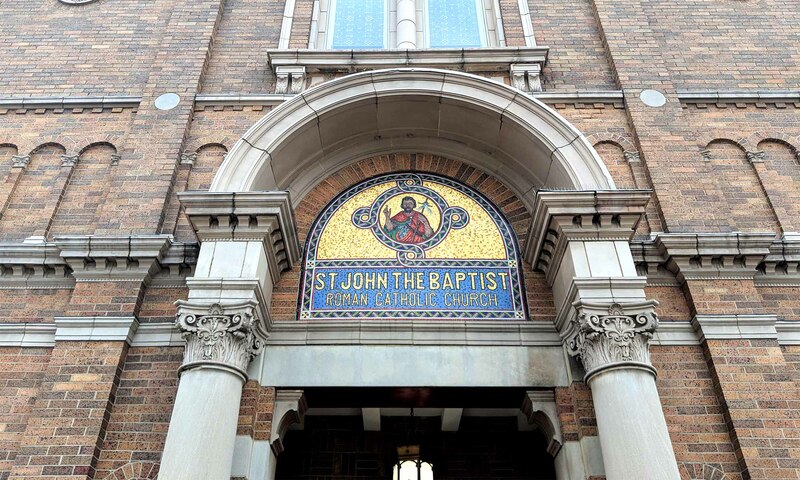 The very first Mass at St. John the Baptist Catholic Church – St. Louis was celebrated in a building at 4626 Delor on February 1, 1914 by our founding pastor, Father John Peters. Parishioners, past parishioners and alumni gathered at 4:30 pm Mass on Saturday, February 1, 2014 with Bishop Edward Rice, Fr. John Keenoy, Fr. John Mayer and Deacon John Wolffer. Also in attendance was former pastor Fr. Ferdinand Wesloh and past associates, priests who grew up in our parish, sisters, past principals and teachers. A dinner followed in the gym with our state representative Michele Kratky and alderwoman Carol Howard each presenting our parish with a 100th anniversary proclamation. (These proclamations now hang in the vestibule of church). The evening was full of fun, food and shared memories. The food was catered by Giuseppe’s on South Grand and the cakes were made by our alumnus, Mary Boehne, a pastry chef at the Four Seasons Hotel. Thank you to all who attended and to all who worked to make this celebration memorable. We are so proud of our parish heritage! We have two display cases filled with memorabilia. One is located in the vestibule of church and the second, a much larger one, is located by the gym doors. The one by the gym is filled with memorabilia of our high school and grade school. This larger display case also holds a framed piece of Fr. Peters’ vestment. We generally have Donut Sunday on the first Sunday of the month (except June, July and August). We invite you for a Sunday morning Mass at 7:00 and at 10:00 am and come to the cafeteria for a donut, social time and to view our display case. Click here to see more pictures of the celebration in an album on our Facebook page.